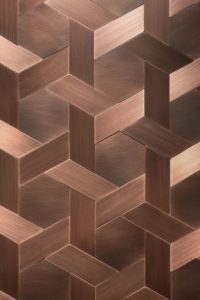 Copper tile is often used as trim in conjunction with other tiles, especially in kitchens and bathrooms. Copper gives any room a “wow” factor when it covers a large area, and it has not been over-used in the big picture of interior design. Copper is an ancient element, unearthed by humans about 4700 years ago. People have loved copper as a decorative and practical metal from that time forward. It presents a timeless, stylish look in tile form in every room of the house. 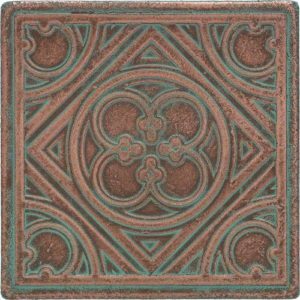 Antique copper is difficult to top for elegance and sophistication, but its warmth is retained in the varied colors of each tile. Dark grays, blues, blacks and browns meld into the reddish copper, providing interest and depth. Warm metallics have been huge in 2014, with copper hues especially taking the lead. he word “boring” does not apply to antique copper, but the word “rich” does. The metallic texture and patina of antique copper make any room unique and welcoming whatever the style of furniture. The “richness” of the copper itself adds something to a room full of antiques or to a contemporary design. Craftsmanship and memories of manual skills, Vienna, a sophisticated covering inspired by a traditional weaving technique. 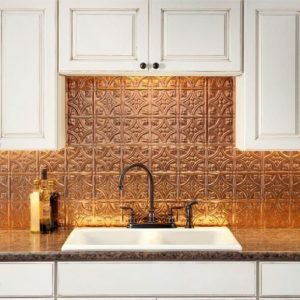 Copper options come in all shapes and sizes from the standard square or rectangular (subway tile) to round penny tile. 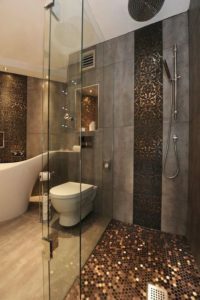 For those who like smaller sized options mosaic tiles that have many tiny sized tiles attached to a mesh backing are a natural choice. 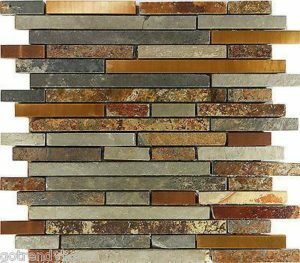 Since copper can work well with quite a few other materials some mosaics will include copper, glass, and certain types of stone together. Minimal maintenance is required to clean copper tile, a real asset in damp areas. Copper is moisture-resistant and covers imperfections in the wall when necessary. Copper does not crack like ceramic or stone tile and wears well. Good quality copper is not inexpensive, but it stands up to time and has a broad appeal. It will cost $18-$50 per square foot and continue to impress guests and homeowners.